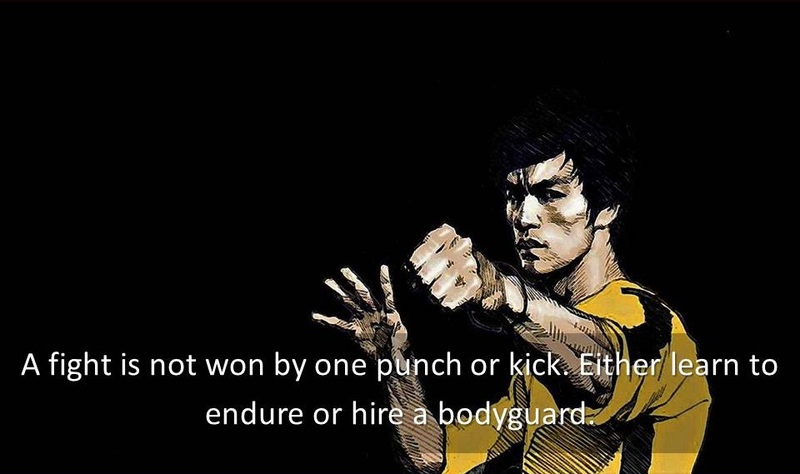 Welcome to Bruce Lee Quotes. Here you will find famous quotes and quotations about Bruce Lee. A good fight should be like a small play...but played seriously. When the opponent expands, l contract. When he contracts, l expand. And when there is an opportunity... l do not hit...it hits all by itself (shows his fist). A good JKD man does not oppose force or give way completely. He is pliable as a spring; he is the complement and not the opposition to his opponent’s strength. He has no technique; he makes his opponent's technique his technique. He has no design; he makes opportunity his design. Again let me remind you Jeet Kune Do is just a name used, a boat to get one across, and once across it is to be discarded and not to be carried on one's back. Always be yourself, express yourself, have faith in yourself, do not you go out and look for a successfull personality an duplicate it. Any technique, however worthy and desirable, becomes a disease when the mind is obsessed with it. Art calls for complete mastery of techniques, developed by reflection within the soul. As long as I can remember I feel I have had this great creative and spiritual force within me that is greater than faith, greater than ambition, greater than confidence, greater than determination, greater than vision. It is all these combined. My brain becomes magnetized with this dominating force which I hold in my hand. Do not be tense, just be ready, not thinking but not dreaming, not being set but being flexible. It is being wholly and quietly alive, aware and alert, ready for whatever may come. It is true that the mental aspect of kung-fu is the desired end; however, to achieve this end, technical skill must come first. Empty your cup so that it may be filled; become devoid to gain totality. For it is easy to criticize and break down the spirit of others, but to know yourself takes a lifetime. I refer to my hands, feet and body as the tools of the trade. The hands and feet must be sharpened and improved daily to be efficient. If nothing within you stays rigid, outward things will disclose themselves. Moving, be like water. Still, be like a mirror. Respond like an echo. If you don't want to slip up tomorrow, speak the truth today. If you want to learn to swim jump into the water. On dry land no frame of mind is ever going to help you. In combat, spontaneity rules; rote performance of technique perishes. In JKD, one does not accumulate but eliminate. It is not daily increase but daily decrease. The height of cultivation always runs to simplicity. In primary freedom, one utilizes all ways and is bound by none, and likewise uses any techniques or means which serves one's end. Efficiency is anything that scores. It is being wholly and quietly alive, aware and alert, ready for whatever may come. It is not a daily increase, but a daily decrease. Hack away at the inessentials. The doubters said, “Man cannot fly," The doers said, "Maybe, but we'll try, “And finally soared, In the morning glow, While non-believers, Watched from below." Now I see that I will never find the light. Using no way as a way, using no limitations as a limitation. When in actual combat, you're not fighting a corpse. Your opponent is a living, moving object who is not in a fixed position, but fluid and alive. Deal with him realistically, not as though you're fighting a robot. Traditionally, classical form and efficiency are both equally important. I'm not saying form is not important - economy of form that is - but to me, efficiency is anything that scores. Don't indulge in any unnecessary, sophisticated moves. You'll get clobbered if you do, and in a street fight you'll have your shirt zipped off you.